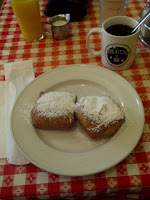 As a friend of mine once said, "A beignet is the lacey architecture for suspended powdered sugar." True that. There are too few places in Chicago that serve beignets and even fewer who do it well. 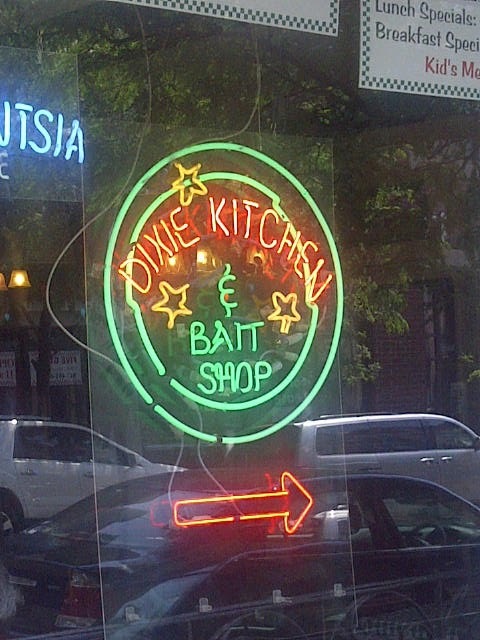 The Dixie Kitchen and Bait Shop serves beautiful beignets. 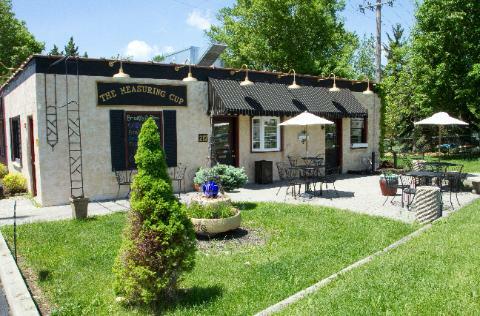 I ate an enormous breakfast here--plates and plates of food. But, it was last June, so I can't begin to remember how much anything cost. I remember thinking it was cheap. I remember thinking that any single dish I ordered was enough by itself for most people to call it a hearty breakfast. I remember my table was cramped and uncomfortable. I remember my server was disinterested. 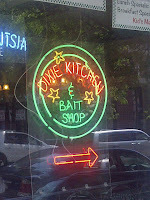 I remember the room was decorated in early 20th century bait shop with the smell of bacon and coffee instead of bait. I remember that those beignets, a couple cups of chickory coffee, and some orange juice were good enough to encourage me to drive the hour or so from my house to Evanston again. Yes, this is a place that has many dishes that would qualify for the perfection zone, but I'll have to go back again to really give them a score. I will return. 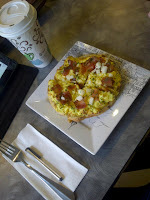 Scrambled Egg Pizza with bacon and onions from Arlene Botta's cafe is a reason to get up in the morning. She serves it with other toppings, too. I'll be back to try other combinations. Both of us who follow my blog know that coffee is not really my thing, but I am enjoying the cup I have right now--sweet, hot, and blonde. Ha! I didn't mean that the way it sounds, but I can live with it. There are 10 seats inside, and there are half a dozen tables on the patio beside the bike path. I bet many people carry out slices of quiche, cups of coffee, and pies. There's a pie on the chalkboard called Strawberry Explosion. Unless I'm weaker than I think, I'm going to wait until next summer to try that. I'm certain that a half dozen of those Thanksgiving Turkey-shaped cookies are leaving here with me in a few minutes, but I'm not certain how many of them will make it home. The menu here is simple. You can get a PBJ for $1.75. But I just bet kids love it as much as their moms and dads love the pot roast. The Measuring Cup measures up well by P$4B standards. The tables and chairs aren't meant for long stays, but the music and ready access to the outdoors make up for it. My pizza starts the scoring at $6.45, but the base pizza is only $4.95. TMC competes in the perfection zone. I'm giving them 50 perk pennies for the alfresco setup even though I sat there for only a few minutes while I waited for them to open. If they had waited my table or been as friendly as they are known for being, they might have scored even lower. Think golf. Low is good. I'm cheap. That's a wonderful score for a wonderful spot.